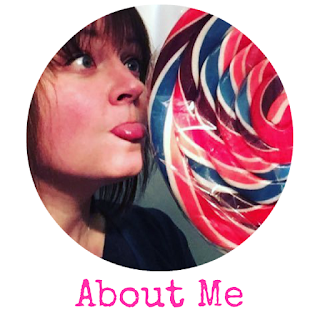 Today has been the first spring-like day - the sun's out, the sky is almost cloudless...it got me thinking about my birthday which is in a month because I really want to be able to use our garden and invite friends over for a BBQ. After watching cooking programmes all morning and most of them featuring chicken wings I thought today would be the perfect day to practice making my own which would be brilliant to have at a BBQ...or picnic, tailgate party or just because. 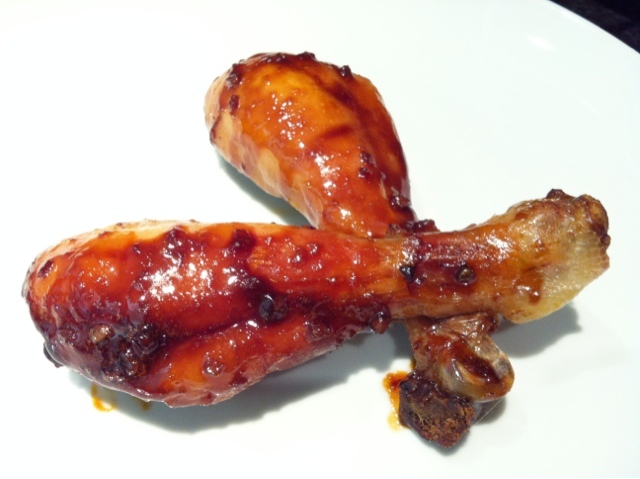 I used a mixture of drumsticks and wings but think the drumsticks work a lot better for this recipe. Mix the soy sauce, sesame oil, finely chopped garlic, grated ginger, sugar and mirin together and pour over the chicken. 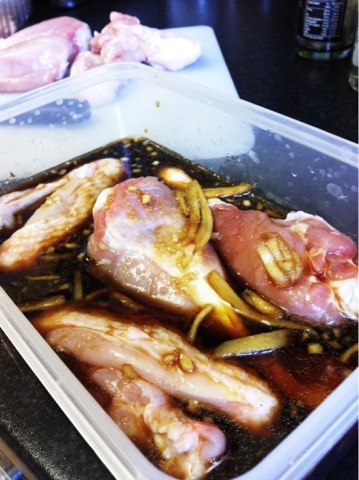 Leave the chicken to marinate in the fridge for a few hours or even overnight. Take the chicken out of the marinade (pour it into a small saucepan for later) and place on a wire rack on a baking tray. 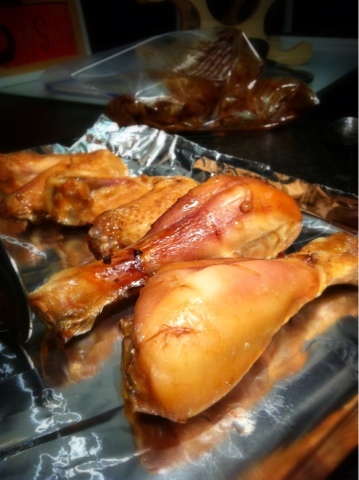 Bake the drumsticks for 35 minutes, turning halfway through. While the chicken is baking bring the marinade to the boil and simmer until it has reduced by over half and has a syrup-y consistency. 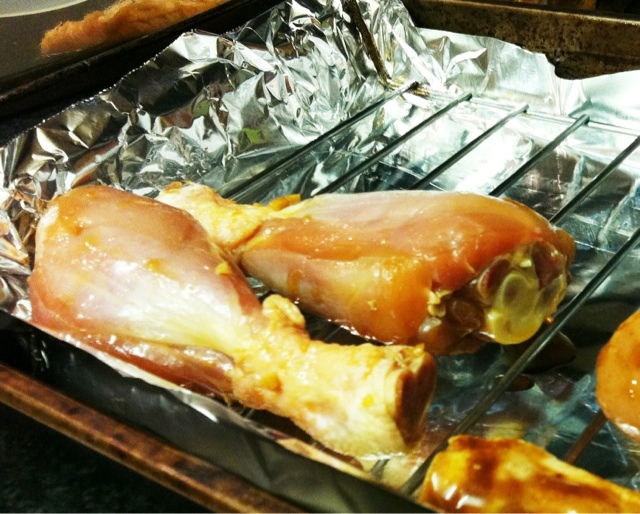 Take the drumsticks out of the oven and place on a baking tray - because the glaze is sticky it's best to cover the tray with foil to avoid any washing up issues later! Spoon the reduced marinade over the chicken. 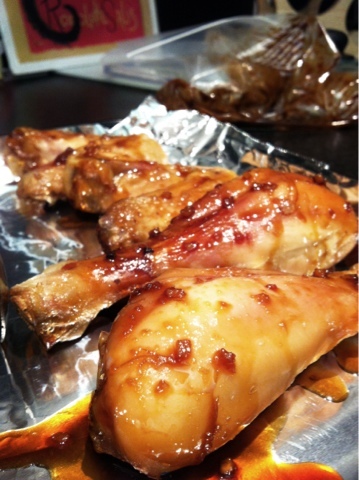 Put the chicken back in the oven and after 5 minutes spoon some more of the marinade over the drumsticks. Return to the oven for another 5 minutes. Once the chicken is cooked, insert a skewer to the fattest part to make sure the juices run clear so you know the chicken is fully cooked. This is such an easy recipe and so good for BBQs, picnics and parties. If you're planning on eating them cold you can make them well in advance!